The Pirates were in contention then, just three games out of the second wild-card spot. Their current position — buried in the wild-card race, six games back in the NL Central — is worse. And they just lost two of three to the expected division champion, the second-place Cubs, whom they trail by 3½ games. It’s not out of the question that the Pirates will rally in the six weeks leading to the non-waiver deadline. More likely, though, they will be in roughly the same position as they were last year, when they traded Melancon and left-hander Francisco Liriano in moves that seemed curious at the time, but — in combination with the acquisition of right-hander Ivan Nova — demonstrated impressive foresight. McCutchen, the former MVP who sparked the Pirates’ renaissance, is more of an institution in Pittsburgh than Melancon was. But the Pirates discussed McCutchen in trades last offseason; the shock value of dangling him is gone. And now that McCutchen has revived offensively — producing a 1.157 OPS in his last 90 plate appearances after spending two days out of the lineup and dropping from third to sixth in the batting order — he’s starting to look like this year’s Melancon. 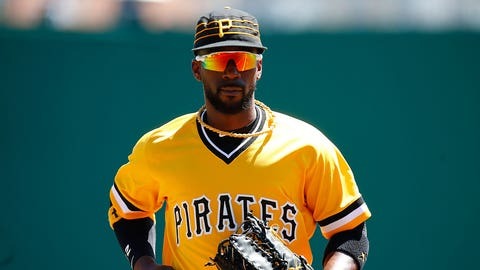 Then again, the Pirates might keep McCutchen, 30, if they come to view themselves as a legitimate contender, even pick up his $14.5 million option if he finishes strong — they’ve carried other players to free agency before, most notably catcher Russell Martin and righty A.J. Burnett. Starling Marte, 28, is scheduled to return from his 80-game suspension for performance-enhancing drugs shortly after the All-Star break, but the Pirates won’t know by the deadline if he will be the same player as before. Gregory Polanco, 25, has produced only a .679 OPS this season, but some of his regression might be due to his .271 batting average on balls in play. Top prospect Austin Meadows, meanwhile, has only a .676 OPS at Triple A, though he just turned 22. Still, the Pirates almost certainly will continue betting on Polanco and Meadows. They’ve got Marte under control through 2021 at salaries that will be reasonable even if he becomes a lesser player. And they know that they actually improved after their deadline trades last season — they were a half-game out of a playoff spot on Aug. 28 before injuries wrecked them in September. If they traded McCutchen, they would not necessarily be conceding — they could replace him with Meadows or perhaps someone they acquired in a trade, maybe another outfielder, maybe an infielder who would allow Adam Frazier and/or Josh Harrison to play more outfield. Again, go back to last year’s deadline. Nova proved a revelation, and the Pirates re-signed him to a three-year, $26 million free-agent contract. Rivero emerged as a top reliever, one the Nationals could use right now. Even the most controversial deal — Liriano and two prospects to the Blue Jays for righty Drew Hutchison – has worked to the Pirates’ advantage. Escaping Liriano’s $13 million commitment for 2017 not only saved the Pirates from a pitcher who currently has a 5.36 ERA, but also created the flexibility for them to re-sign Nova, extend third baseman David Freese and sign free-agent reliever Daniel Hudson. Cole, Nova and righty Jameson Taillon will give them a formidable top three through at least 2018, and they’ve got any number of young pitchers who might fill the other two spots — Tyler Glasnow, Chad Kuhl, Trevor Williams, Steven Brault, Nick Kingham. Doesn’t mean it won’t work in the future. Doesn’t mean it won’t work without McCutchen. 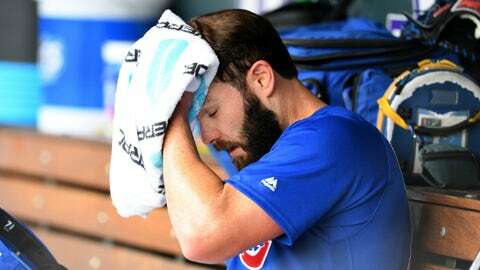 “As much as we don’t want to say that it carries over from season to season, throwing almost 500 innings over the past two years, I think it did have some effect,” said Arrieta, who threw a combined 468 1/3 innings in 2015-16, including postseason. Only one pitcher, Max Scherzer, has thrown more innings than Arrieta since the start of ’15. Scherzer, however, has experienced no decline in performance, and he’s more than two years older than Arrieta, who turned 31 on March 6. Hall of Fame pitcher John Smoltz, after I mentioned Arrieta’s remarks during Saturday’s Cubs-Pirates broadcast on FOX, said that too much emphasis is placed on innings in today’s game, and correctly noted that Cubs manager Joe Maddon protected his starters as much as possible during the 2016 regular season — Arrieta threw 197 1/3 innings, down from 229 the year before. Still, Arrieta started Games 2 and 6 of the World Series and warmed up for a potential relief appearance on zero days’ rest in Game 7. While most starting pitchers rest in October, the ones who reach the World Series work not only for an extra month, but at maximum effort the entire time. Each of the Cubs’ principal starters is performing worse than he did last season, and righty Kyle Hendricks currently is on the DL with right hand tendinitis. The Indians’ starters who pitched in the World Series also have regressed, and ace righty Corey Kluber earlier missed nearly a month with a lower back strain. Arrieta, a free agent at the end of the season, has a 4.64 ERA after 14 starts. His average fastball velocity is down from 93.6 mph to 91.8, according to Fangraphs. He said he is learning to pitch differently, placing a greater emphasis on command, changing speeds, disrupting hitters’ timing. “That’s just another facet of the game that you have to try and perfect, using information that hitters give you vs., ‘Ok, I’ve got 95 to 97, let’s throw a sinker, middle down, and see what happens.’” Arrieta said. “I can still do that quite a bit. But there are two or three guys in each lineup where it doesn’t matter how hard you throw, if it’s in the area they’re looking, they’re probably going to do some damage. “It’s trying to pitch away from guys’ slug, knowing where their hot zones are, pitching accordingly. But at the same time, if I have three or more pitches working that day, it still doesn’t matter that much. 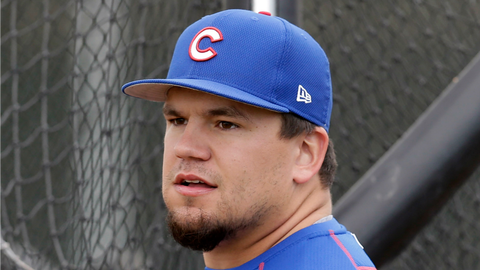 Arrieta, in our conversation Friday, also revealed that he has been dealing with a difficult family matter – about two weeks ago, his mother-in-law, Debbie Andrews, underwent her second brain operation in six months. “Not at all,” Arrieta said. “Did I think about it? Did I worry about it a lot? Yes. But I was still able to separate – I have to train, I have to prepare, I have to scout, I have to go pitch. 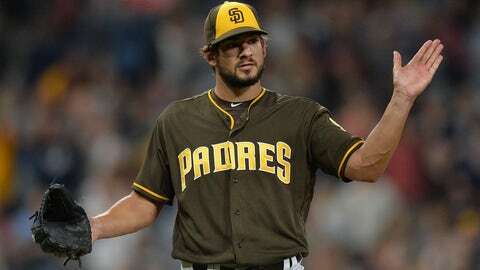 One rival executive says the Padres are looking for a “Will Smith-type return” for left-handed reliever Brad Hand, who is under control for two-plus seasons. Such an ask might appear aggressive – Smith was under control for three-plus seasons at last year’s deadline when the Brewers sent him to the Giants for minor-league right-hander Phil Bickford and catcher Andrew Susac. “When Manny gets hot, he gets hot,” Alonso said. “I don’t worry about too much about him. He’s such a freak. 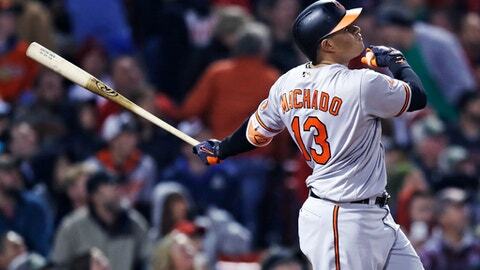 *Don’t expect the Cubs to give up any of their young major-league hitters in a trade, knowing that they could be making a major mistake if they overreact to a few bad months from any one player. The bottom line is that prospects do not always follow a linear progression, and some of the Cubs’ youngsters are remarkably inexperienced, even though all but Ian Happ played in the World Series.